As we all know, standard fiber patch cables can be divided into the single-mode type and multimode type. Data communication is more stable between fiber patch cables with the same mode. When single-mode and multimode cables are directly linked together, an effect named as differential mode delay (DMD) often occurs. It is a variation in propagation delay because of the differences in group velocity among modes of an optical fiber. Under the influence of DMD, cable distance is greatly limited and network bandwidth is also reduced over the distance. However, using the single-mode cables with multimode cables is sometimes necessary for certain applications. Is there any solution to this problem? Of course, this is why mode conditioning patch cable is made for. Mode conditioning patch cable is always designed to be the duplex style. It contains a conditioned channel with an offset fiber connection part. The connectors on both ends are also optional from LC, SC, ST and other types. In general, mode conditioning patch cable is needed when link distances are over 300 meters. Although mode conditioning patch cable looks different from the standard fiber patch cable, they both function for the same performance. Cable offset is the core of mode conditioning patch cable. A multimode fiber and a single-mode fiber are fusion spliced together with a precise core alignment and angle inside the offset. Optical light is launched from the single-mode fiber to the multimode fiber at a precise angle, which provides the cable with mode conditioning functionality. In this way, optical signal is able to freely pass different fiber modes without the problem of DMD. Mode conditioning patch cable is suitable for 1000BASE-LX long wave applications of Gigabit Ethernet, such as 1000BASE-LX routers, switches, or transceivers. This is because 1000BASE-LX should operate for both single-mode and multimode cables. 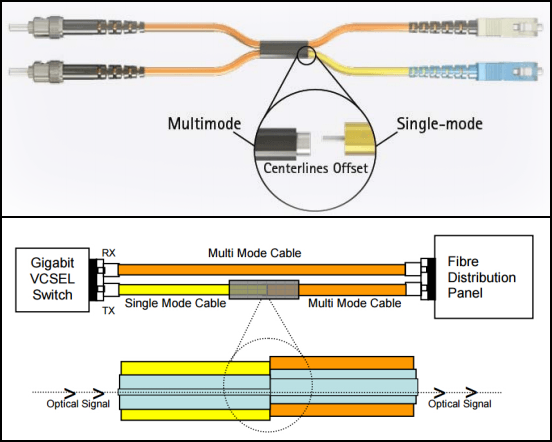 A mode conditioning patch cable eliminates the multiple signals by allowing the single-mode launch to be offset away from the center of a multimode fiber. 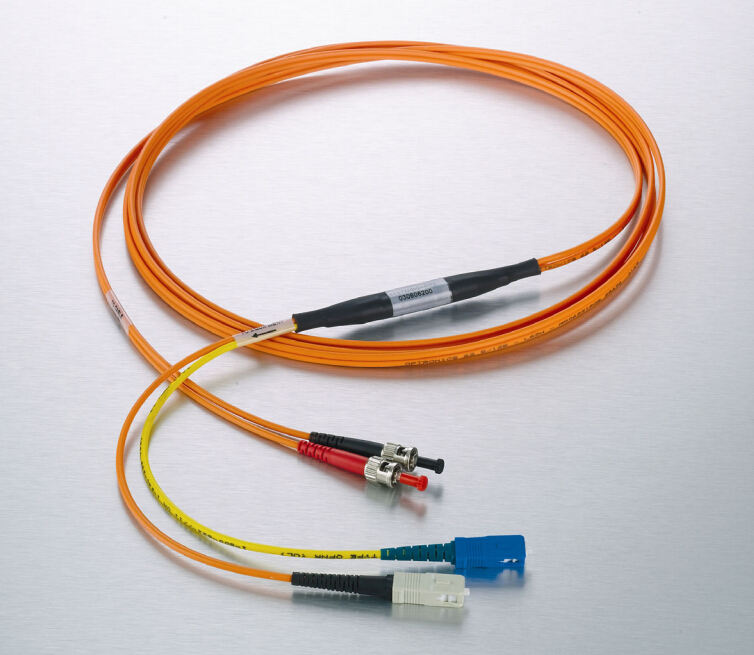 When the Gigabit LX switch is equipped with SC or LC connectors, the yellow leg (single-mode) of the cable should be connected to the transmit side, and the orange leg (OM2 multimode) of the cable should be connected to the receive side. Both ends must maintain this configuration. Exchanging the transmit and receive is only allowed at the cable plant side. In addition, mode conditioning patch cords can only convert optical signals from single-mode to multimode. If you want to convert from multimode to single-mode, you’d better use a media converter. Mode conditioning cable is a special fiber patch cable designed for reducing the differential mode delay between single-mode and multimode data transmission. This type of cable is usually used in pairs. Different connectors types, cable jackets, fiber types, cable lengths are also available to meet your demands. This post provides some basic knowledge about mode conditioning cable. If you are interested, please visit FS.COM for more information.